Northern Virginia is the most diverse and arguably most dynamic area of the state that Forbes.com consistently calls one of the Best States For Business. This region has the largest population in the Commonwealth with nearly 2.5 million inhabitants and a cumulative work force of nearly 1.4 million. With over 60 institutions of higher learning and 24 local workforce centers, this region is vibrant, high tech, and filled with a labor force that is very well educated and ready to work. 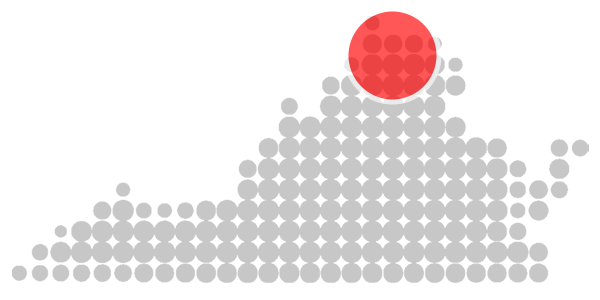 Comprised of the counties of Arlington, Fairfax, Fauquier, Loudon, Prince William and Rappahannock as well as the cities of Alexandria, Fairfax, Falls Church, Manassas and Manassas Park, Northern Virginia is home to six of the twenty highest income counties in the U.S. and is the most ethnically diverse region in Virginia. Northern Virginia is home to many technical and service companies as well as a large number of foreign and U.S. based corporate headquarters. The reasons for choosing this area to begin, expand or relocate a business are very evident when you look at the local infrastructure of, highway, rail, and air as well as available properties throughout the region. Within a stones throw of the nation’s capital, Washington D.C and major cities in the state of Maryland, Northern Virginia, has access to political, retail, historical and informational avenues that no other area in the state can boast. To help support and entertain the larger population in Northern Virginia, the counties, cities, and businesses of the region offer world class healthcare facilities, schools, theaters, art galleries, cultural activities, libraries, shopping, restaurants, as well as parks and recreation areas that together make the region very livable, desirable and accessible for businesses and families of all sizes. In addition, there are historical areas in much of the region that date back to the founding of our country. On any given day, you may find yourself on the same cobblestone streets and river fronts that our founding fathers traversed and enjoyed. As you can see, Northern Virginia is both charming and dynamic, historic and modern all at the same time. Navigating the commercial real estate waters in this kind of region requires a firm that understands the area, the people and the market. If you are looking for a company that can help you with any and every step of the process, we would like for you to think of us – we are Dominion Commercial and we know Northern Virginia. Our expertise and local knowledge can help you find the right fit for the right price in the timeframe you are looking for. This region has the largest population in the commonwealth with over 60 institutions of higher learning. Connect and follow Dominion Commercial through facebook and twitter to find out what is happening with commercial real estate and other items of interest throughout Northern Va.